L. and I are buying an apartment. I'm really excited about it. One of the things that is way more exciting than it should be to me is the parking system. Our tower has two parking garages that are totally robot garages. We have to apply for a parking space, and we need to specify the size of car because they have different sized spaces in the robot garage. I've seen other versions of these things, circular ones that can store more cars than this one - this version only has storage places on the left or right of the transit tower, although the cars do rotate 180 degrees in there somehow. They go in head first, and come out head first. There is also a nice bicycle robot parking system in Jiyugaoka near where I currently live, but I've never had a chance to peek in there. That one is one of the circular storage systems though. I'm a little disappointed that the bicycle storage system at our new place isn't robot powered, but you can't have everything. Note: the links to the left are referral based things that might, at some point in the future, make me money somehow. I don't really care about that, but I couldn't find any other way to get pictures of the covers to show up (since it looks like they block non-amazon referrers.) Also, in general I like Amazon and don't mind driving traffic to them. On the last international flight I took, before getting on the plane I picked up two books. One of them is a kind of current-events sort of deal, Barack Obama's "The Audacity of Hope". I'm really excited about the upcoming US Presidential election. To tell the truth, I can see positives in each of Barack Obama, Hillary Clinton, and John McCain, but I'm most excited about the prospect of Barack Obama becoming president. He made a joke about bubble sorts. He's also been covered a lot on Slashdot, and it really seems like he has a good grasp of some issues important to people in the technology field. I've been intrigued, and have become interested in learning more about his views, so I thought it would be my civic duty to read his book. I'm not really going to give any summaries or big overviews, but I enjoyed the book, and thought it was an easy, fun read. I found his analysis of some of the problems that America faces to be well thought-out and his policies also look very reasonable. There was one chapter on religion and the family that sounded like an appeal to a broad American religious base, but it isn't a fanatical style of mixing religion and government; he clearly believes in the separation of church and state, which is good enough for me. His oft-mentioned points of diversity and hope are also very appealing, so I'm really looking forward to the upcoming election. It is disappointing to me that we only have two major parties and two realistic candidates, but at least that means that if I want to be fair, I only have one other book to read. This is a book that I bought purely on recommendation of a random person on slashdot. It came up in a discussion of science fiction novels (of which I'm a big fan) although it isn't of the space ships and aliens variety. I wouldn't even really classify it as science fiction so much as just fiction written from an interesting perspective. It is really interesting to go into this book without knowing much about it, but I will say that I really enjoyed this book, and highly recommend it. I don't generally like novels that use narrative gimmicks (I can't tell if I'm sick of, or enjoy, the unreliable narrator) but even though this book has its gimmick, it doesn't come off as gimmicky. This is apparently a young adult novel, but I have a thing for well-written young adult novels - particularly Garth Nix's Abhorsen Trilogy and Shade's Children - so that isn't a problem for me. Anyway, I really liked this book, and am going to make space for it on my bookshelf. That's pretty rare because I get the feeling that I won't have too much bookshelf space after the move to the new apartment. A few weeks ago I got a big, fat letter from Setagaya county. I knew that they wanted money from me, and specifically money for having the honor of living in their ward. I wasn't in any rush to open it. I wonder if I had just refused to open, like the White House, if it would all just go away. Probably not. So I finally opened it over the weekend, and found out that I had to pay up on Monday. 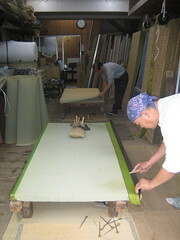 After pulling out some money, I walked by a local shop that makes tatami mats. I've seen that place once or twice before, but generally they are never open when I am around. I had a camera handy and asked if I could take a picture. It would have been nice to hang around and get some shots of them working on those mats by hand, but I had to get going to get my taxes paid and get to work. It really is pretty amazing though: they do all that weaving and finishing by hand. It looks really tedious. Finally, I also found another interesting candy bar at the local convenience store. 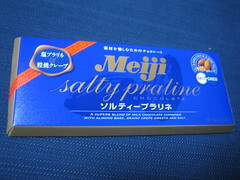 Meiji Salty Pralines Chocolate. It is pretty good! I just barely taste the salt, and I really liked the pralines a lot. There are a few more salt and chocolate items that I saw, so maybe I'll pick a few more of them up. After L. and I got married, we took a trip to Morocco for our honeymonn. Actually, I had made a committment a long time before to attend the 2008 LREC Conference in Marrakech, Morocco, so we went together as a kind of honeymoon. It was the best honeymoon conference ever. Today I went with L. for the second apartment viewing. On the first viewing we filled out a form with 10 issues we found in the apartment. The majority of them were small bumps in the wall, or a few were areas where there were imperfections in how the finishing on the doors, or how the doors close. They addressed all of the issues, and we pointed out a few more new ones that we found, but generally things are looking good at the apartment. We were presented with one major change though: in the living room where the pipe from the air conditioner blower unit to the compressor was supposed to be, it turns out that they could not put the compressor where the initial plans indicated they would be. 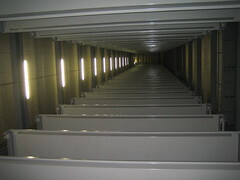 Instead, the compressor had to be moved to the other side of the room, so the exit pipes were changed to the other side. This is a problem because we plan to have custom built shelving put where there is now an exit pipe, and two access panels for the air conditioning unit. In the end the company that does the custom furniture was able to work around the constraints, but it is kind of annoying. When we finally finished up everything, L., her parents, and myself all went out for an excellent sushi dinner. I'm back in Japan - got back in just about a week ago. I've been really busy catching up on stuff, and very soon I plan to post an entry about my "wedding week". Next up is a post on the trip to Morocco for a conference / combined Honeymoon. In short: Wedding Week was awesome, got to see my family and my amazingly beautiful wife. The honeymoon was also great, with two "surprise" trips to Casablanca and Milan. More on that later. For now, I just wanted to say that I am busy, tired, and now sore. I went running this morning with my friend Sebastian, a marathon runner. I haven't run for three months, so I'm out of shape. Horribly, horribly, out of shape. All this interest in blogs and user generated media seems to have had an impact on "traditional" print media. Recently, there was a workshop on the Future of News. It was held at Princeton University, near my old stomping grounds. It would have been nice to go, but thanks to the (news-media destroying!) blogs, I've been able to at least get a brief impression of what was discussed. Matthew Hurst's great Data Mining blog has two posts with pointers to some summaries from the workshop. Fun stuff. I'm firmly of the opinion that traditional news media will be around for a long time. Blogs do have some role to play in modern news dissemination, but not a large enough role to displace focused organizations that can fund people to do research and have a vested interest in vetting information. It isn't clear to me that the newswires do as much of this as they should, but the traditional media certainly will play a role in choosing what news to elevate to the national level. I'm always interested in adding new options to my menu of things that I can (poorly) cook. I often cook some kind of curry rice (it is one of my favorite dishes, it is easy to make, it stores well, and it is flexible because you can always add some side dishes to it) but it is nice to have some variety. One thing I always look for is a simple dish that I can cook up on the weekend and eat over the week. One of the things that I ran into lately is Mabo Tofu. 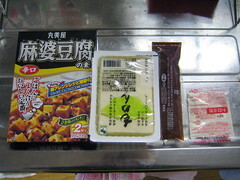 Mabo Tofu is a kind of spicy flavored Tofu. I saw a package at the Supermarket that said it is a mix for the stuff, all you have to do is basically add this stuff to Tofu and you are set. Sounds easy enough. 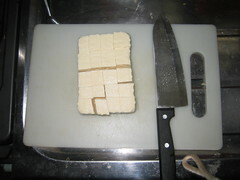 Basically, you make the stuff by cutting up your Tofu into small blocks - this is surprisingly fun, and if you get the hard Tofu it works fairly well - and then add some water to a pot. Put in the flavor packet, and heat it up. While you do this, there is a packet of corn starch that comes with the mix, which you should mix with water. The first time I made this I added ten times too much water, and ended up with a kind of Tofu soup. It was actually really good, and I think I'll make that sometime in the future as well. If you do it right, you bring down the heat and mix in the thickening agent, then heat it up again. The second time around I also coocked up some hamburger and threw that in - it was great. Unfortunately, this stuff doesn't keep very well. After about three or four days it starts to smell bad. It still tastes good, but starts to smell like ... rotten bean paste. Well, more like you would imagine rotten bean paste would taste like. It turns out that it mixes fairly well with Curry too. I don't mean that you should mix them together, just that having some curry one one side of rice, and Mabo Tofu on the other is pretty good. This week was "Golden Week", a sequence of usually 4 days off at the start of May. This is one of the big holidays in Japan, and people usually have big plans for the break, including overseas travel and the like. The gas prices always seem to go up a bit before Golden Week, and miraculously return to normal a few days afterwards. This year, things are even crazier because of the reinstatement of the lapsed "temporary gas tax" (temporary since 1954! - well, 1974 for the actual temporary part, but there have been gas taxes in effect since 1954. ), which are about 50 yen a liter. I don't really want to write about that - it was reinstated in a recent push by the upper house that overrode the lower house and probably angered a lot of people - but just wanted to quickly jot down the things I've been doing on my "vacation". I wanted to get some work done over the four day break. Usually the holidays are four weekdays, but timing is particularly bad this year, and two of the holidays fell on the weekend, so we only got Monday and Tuesday off. I brought my work laptop home so I could do some programming, but as often happens high hopes clashed with reality and I didn't get as much done as I wanted. On Saturday I slept in, and did some needed cleaning around the apartment. I watching some TV, and started looking at my email backlog (that always takes longer than expected.) I have family coming to visit soon and spent some time planning for that, and then in the evening decided that I would take advantage of the holiday and play a game. Quite a while ago I bought Galactic Civilizations 2, a space war and conquest game. It is really cool, and I was totally obsessed with it for a while. Because I'm the obsessive type, I just drop things cold-turkey when I think they are taking up too much of my time. I think by the time I realized what had happened, it was 6am on Sunday morning, and I had wasted about 14 hours in a blink. So I've put that away again, and won't go back until I can learn to set a timer or something. Back at home I spent a few hours reading up on the FrameNet project, which I'm using in some research. The framenet book is pretty large, but does not cover the xml file format and all that stuff. Since the data files are pretty large, it is a daunting task to dive in and start using them right away. I'm very surprised that there are not more well-developed interfaces to accessing FrameNet in Java - there are two that are kind of old, and don't look very well adopted, unlike the state of affairs for WordNet, which has many Java interfaces. On Sunday night I went out and met a friend for dinner, which was lots of fun. I've been cooking at home a lot lately and it is really nice to eat something that I didn't make myself. 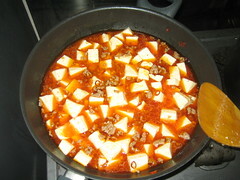 I have started making lots of Mabo tofu lately, which is pretty good and very easy to make. Monday I spent some time doing work email, and a bit of programming (getting a feature set developed for a CRF learning system) and in the evening I went to my finaceé's parent's place for dinner. Unfortunately, L. was sick, and holed up in bed. Still, dinner with the in-laws was nice (more food I didn't cook!) and I helped L.'s dad set up his email on a new computer. Today I've spent the day working with a FrameNet semantic labeler from the NLP group at Lunds University. It looks really great, because it will save me the trouble of having to build a learning system to map from syntactic dependencies to semantic roles. Since that is a pretty tough project in itself, I wouldn't be able to do it justice because really I just want to use a bit of the semantic information in FrameNet for sentiment analysis. As vacations go, it was nice because I spent maybe two days goofing off, and then a bit of time working but in a more relaxed environment than usual. While I was dozing off in the afternoon, I heard something strange out my window: English! I poked my head out and it looks like another foreigner is moving in nearby. Neat. A while ago I bought a 500GB Time Capsule and Leopard at work to use as a backup solution. It took me a while to find the time, but I had a lot of papers to read recently so I installed Leopard and set up the Time Capsule while reading the papers. First off, I'm really impressed with Time Capsule. It costs only a bit more than an external hard drive, but had a Gigabit Ethernet 3-port switch and 802.11n wireless. It feels very solid, is small, and is very, very quiet. I have an external IO Data 500GB hard drive right next to the Time Capsule, and it just drowns it out. Even after turning off that drive, I had a hard time hearing the Time Capsule. I'm really shocked at how quiet it is. Setting the Time Capsule up was really simple, Zero Conf is just great for getting things on a network and making it easy to find them. Since we've got wireless at work I turned off the wireless interface, and just used it to extend the wired connection I already had. Once I set up Leopard on my machine, I started the Time Machine backup, and I have to say again that I am really impressed with how quiet the drive is: I had to listen pretty hard to hear the write noise. I was using ethernet plugged into the Time Capsule for the backup, so I was surprised that I was only getting about 10 MB/sec (sometimes up to 12) to the drive, which surprised me. The Gig-E connection should be able to support 125 MB/sec. Well, not really of course, but 10 MB/sec is an order of magnitude less than I expected! I'm very, very impressed with Time Machine. I haven't played with going back in time for the recovery stuff yet, but it looks like it will be great. I had been using an rsync-based backup solution that would use hard links to not duplicate files that have changed, but there are some problems with that solution. It works very nicely, but every four hours I run the backup script, and for about ten minutes the hard disk thrashes madly as rsync runs down the file tree looking for new files. I had it in a cron job, and nice'd the process so the machine is still totally usable, but there is a noticeable drop in performance, and sometimes you get the dreaded beach-ball while it thinks about file operations. Time Machine uses a very similar approach, but Apple does some other magic that lets them link directories (not possible with standard Unix tricks as far as I know) and more importantly uses a DBUS-style notification system that tracks file operations, and keeps a list of things that have changed since the last backup. It doesn't have to check the whole file system for changes, it just has a list of things that have changed. The backup is impressively fast. I'm really impressed with how easy it all comes together: this is a consumer solution. There are no real drawbacks: the backup is so fast you wouldn't notice it happening (after the initial full backup) and the drive is so quiet that you can just forget it. - The "Spotlight" window is now a real finder window and you can use exposé to find it. In Tiger if you are in finder and do a "show application windows" the Spotlight window does not exist! - Spotlight is a bit faster now for launching applications, which I use all the time. - I like the coverflow view for windows much more than I expected. Being able to see large views of PDFs makes it really nice to look for a paper. It also helps recognizing Word and Excel documents quickly much more than I expected it would. - They fixed the annoying "yellow cursor bug" in the X11 server. Yay! - Mail.app again defaults to sending Japanese email in UTF-8. Generally, I think this is a good idea, but for some reason if email isn't in ISO-2022-JP for Japanese a lot of mail clients turn it into gibberish (mojibake). What really surprised me is that this happened with someone on Windows Vista - I don't know what client he uses, but if you are on Vista shouldn't your email client be able to read the headers and use UTF-8? Most mobile phones can only accept ISO-2022-JP, but I would think big computers could deal with it fine. By the way, to set the default encoding for Mail.app, you can enter "defaults write com.apple.mail NSPreferredMailCharset "ISO-2022-JP"" in a Terminal window. I vaguely remember having to do something like this on Tiger as well. 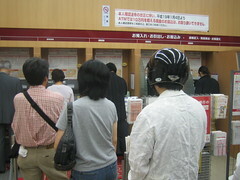 As of April 1st due to some law changes in Japan many people are changing to a new health insurance plan. I'm also switching plans, either because the type of employment I have has changed, or because of the health change laws - I don't really know. I saw a story on the news about some people who are in a situation where their old health insurance cards are not valid, but their new cards have not come yet. I'm currently in that situation. I went to the HR department the other day for something unrelated to health insurance, and while I was there I had a conversation about my health insurance. My new card hasn't come yet, but they want me to turn in my old card. I asked them what I should do in case I got sick. They said "Well, tell them that you are waiting for your new card." It wasn't clear what would happen at that point there. So in the end: just try really hard not to get sick. I hope that new card comes soon! I've been neglecting this blog a bit lately. I've been a bit worried about the personal / public boundaries a bit, but one of the reasons I have a blog (besides the fun part of playing around with blog software on my personal server) is to keep friends and family up to date with that is going on in my life. So I would be remiss if I didn't write about one of the biggest events in my life to date: two weeks ago, I proposed to my girlfriend, Lisa. I met her almost two years ago (we met at the We Are Scientists concert in Shibuya on May 12th, 2006) and we've been dating for about a year and a half. I won't go into detail here (that whole public / private thing) but Lisa accepted, and we will be getting married! This year seems like it will be full of big changes. Lisa and I currently in the process of buying an Apartment together in Shinagawa, which will commit me to a mortgage, and through the transitive property of debt, a country for the next many years (where I don't like to think about how a large a number many is.) We've applied for a loan together, and have preliminarily been accepted by at least once bank, so once the apartment is finished (August 15th is the date that it is supposed to be completed) we should be moving in. Hearing all this stuff about the US Subprime Mortgage meltdown is a bit scary, but as far as I can tell they don't have ARMs here, and the terms of our loan looks quite reasonable -- actually cheaper than what I pay now in my rental place. I'm really excited about life with Lisa though - we've been spending a lot of time together over the past year, and she really gets me. She doesn't mind that I'm nerdy, spend too much time on computers, watch Star Wars, and love some crazy music. She's got great taste in music herself, and has introduced me to some great bands. She also picked up an extra ticket to Summer Sonic for me too. She's the best. Things will probably be super crazy busy for me over the next few months, but I'm also really looking forward to May, when we do the paperwork for the marriage (no time like the present!) and my family (mom, dad, Jana, Alana, and Grandma Bessie) come out to meet Lisa's family. That should be interesting. Even though we're doing the legal paperwork soon, we plan on having a wedding ceremony sometime in the summer of 2009 - probably May 24th, 2009. Also, it is likely that the ceremony will be in Hawaii based on the information Lisa's been giving me. I really want to have a celebration where friends and family can gather and have a great time together, so I'll be in touch about that once we firm up our plans. I'm feeling a bit overwhelmed, but am really happy!